Miss Kim is now open for lunch! A bit more laid back than dinner, the new daytime menu includes a lots of delectable choices, from rice bowls to sandwiches. And it’s not strictly Korean, either. 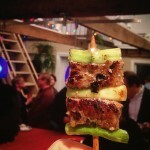 “It’s more casual, fun in atmosphere but also in our food. 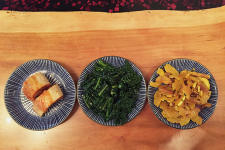 For dinner we’re focusing on the tradition of Korean cuisine—for lunch we are finding inspiration everywhere!” says Ji Hye Kim, Managing Partner of Miss Kim. The bowls on the menu are perfect for warmer weather and can be served as a rice bowl (multi-grain purple rice at the moment!) or salad. 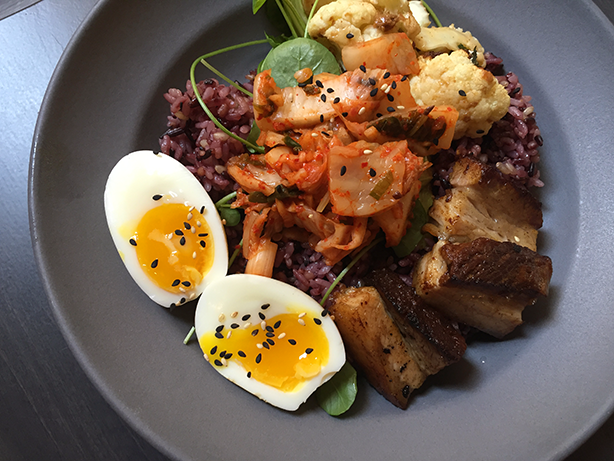 The Kimchi Pork Bowl includes roasted pork belly, a six-minute egg, a pile of house kimchi, and seasonal veggies. 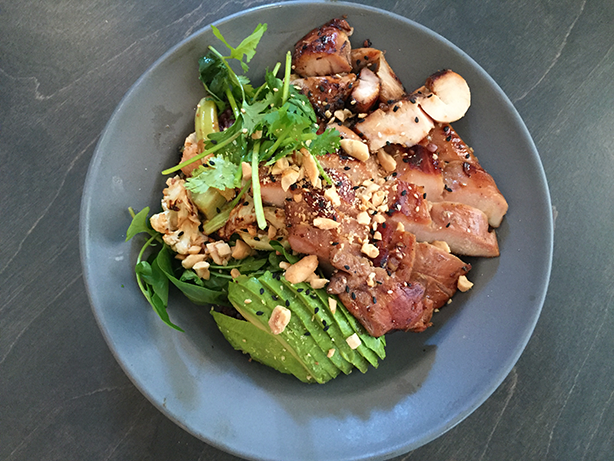 There’s also the a delicious Garlic Chicken Bowl and Tofu Avocado with wasabi soy sauce for a little kick. 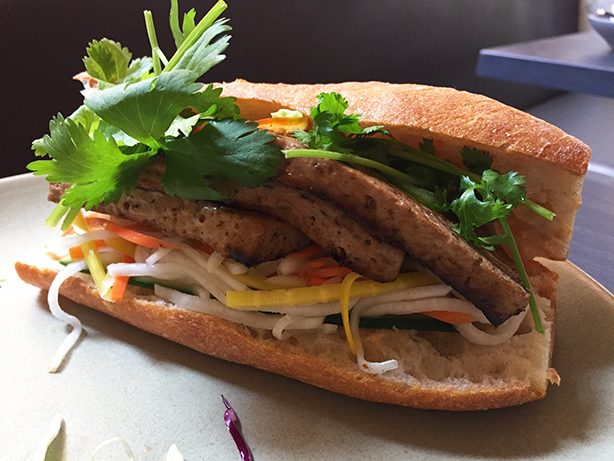 Sandwiches also get an upgrade with Miss Kim’s Banh Mi. Served on Zingerman’s Bakehouse baguettes (made with rice flour especially for Miss Kim), they come filled with chicken, slow-roasted pork shoulder or tofu along with traditional banh mi extras, like cucumber, pickled radish and carrots, cilantro and jalapeno. We added sriracha mayo, too. 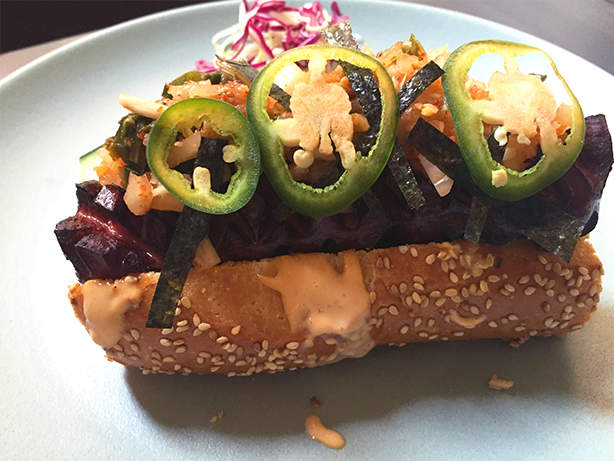 The Hot Korean Dog is fun, and it’s definitely an early favorite. The jumbo hot dog is cut strategically to add delicious crunchy bits. It literally drips with that sriracha mayo we mentioned and is topped with kimchi, jalapeno, cucumbers, and roasted seaweed. Don’t miss it! Fans of Miss Kim predecessor San Street will be happy to see that the buns are on the menu. 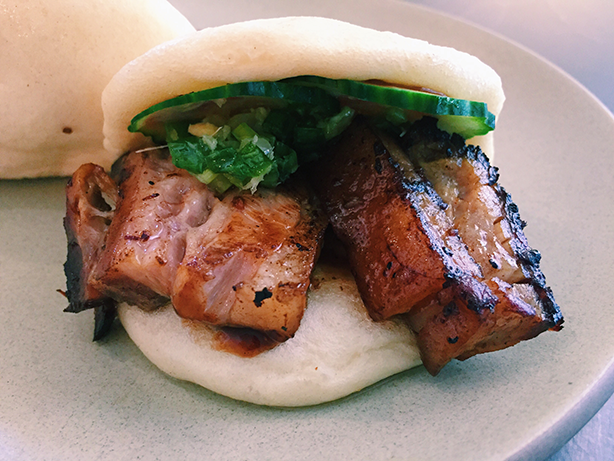 Pork belly with hoisin sauce and ginger scallions as well as mushroom with sriracha mayo are available—the best part is that one order come with two, so you don’t have to choose! Miss Kim Is Open: Here’s a First Look! «Here’s a Sneak Peek of the Cream Top Shop. Join Zingerman’s Creamery for the Grand Opening!